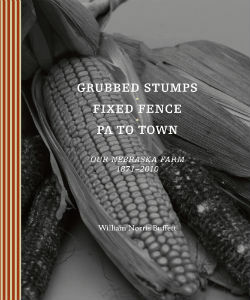 In an age when the small American farm is fast disappearing, Grubbed Stumps takes us back to the early days of Midwestern farming--when the first homesteaders in Nebraska struggled to tame the wilderness. . . .
Bill wrote this book in honor of his ancestors, farmers from the Inavale area in south central Nebraska. Stories, photos, family papers, historical documents, and recipes help recount the history of a farm that was in his family for almost 140 years.